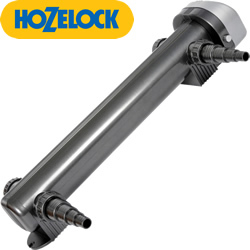 The new Hozelock Vorton 55w offers the optimum UVC power for the pond size up to 18500 litres. Higher 55w powered UVC bulb help maximise the elimination of algae. Vorton 55w comes with 5 metres of cable, is easy to install and maintain and comes with 3 years warranty and a Clearwater guarantee. In-built Turbulator - The flow of the water through the UVC, created by the product design, increases the units efficiency by even exposure of the water to the UV light and eliminate the possibility of air locks. Single ended UV lamp - The lamp design means 30% more UV light is emitted than a double ended lamp of the same wattage. These lamps also stay efficient up to 60% longer than double ended lamps, which means the lamp usually only has to be changed once a season. Quartz tube - Quartz allows 87% of the UV rays to pass through it and penetrate the water where it can act on algae. Materials used in many other UVC units on the market such as plain glass and plastic only allow 30% and 50% of UV rays to pass through then respectively. Operating temperature - Careful product design ensures the UV lamps are kept within their optimum operating temperature range, which means that they are always working at their most efficient. The Hozelock Cyprio UVCs are not sterilisers. The problem with sterilising the pond water is that the fish can lose their natural immunity to disease. If a fish is moved, or if a new diseased fish is introduced, the effect on the fish can be disastrous. Hozelock Cyprio UVCs are water clarifiers. Their job is to clear the water without potential side effects to animal life. Multi-directional inlet / outlet - Being able to rotate the inlet and outlet through up to 360º makes it much easier to route the hose to and from the unit. Quick connect hose connections - Joining up the pipework is simple, aiding installation and disconnection for cleaning and maintenance. Translucent stepped hosetails - The UV light causes the hosetails to glow clearly indicating when the lamp is operating. The steps in the hosetails enable the correct diameter of hose to be attached to the UVC, so that the they are working at their most efficient. Extendable - A tandem conversion kit is available with which the teo UVCs can be combined enabling the largest ponds to be treated or to enlarge the system if the size of a pond is increased. Bayonet fitting of electrical house - Easy access for cleaning the quartz tube and main body. Dome ended quartz tube - Cleaning and sealing is simple with only one open end. Detachable mounting bracket - The UVC can be easily removed from the mounting bracket to aid servicing and maintenance. The whole UVC unit has an IP65 waterproof rating, and is designed for outside use. Translucent hosetails mean that the lamp can be checked without dismantling the unit. The UVC is easily dismantled and even the quartz sleeve can be safely removed as a result of its simple bayonet fittings.